Our software includes three main web applications: iShelter, adminShelter, and webServiceShelter. 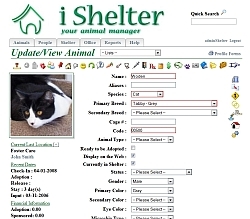 The iShelter application allows you to enter new people and animals and keep track of their records and history. It's the main application for the shelter. The adminShelter application allows you to configure iShelter to fit your needs. You can add new people and set their privilege levels for every section of the iShelter application. It is possible, for example, to assign different privileges to different people in the shelter. You can set them so that some of your personnel will be able to view, add, and update certain records, whereas other employees/volunteers may only be able to view them. You can fully control "who does what" in your shelter. It is entirely up to you how you want to configure the different roles in your shelter. You can also create your own categories for every area of the system. You can make it as complex or as simple as you want. The webServiceShelter application is a web service provided by iShelters. Web services are little programs that allow you to connect your web site to your data in iShelters. That means you can set-up your web site to dynamically retrieve the animals in your shelter and display them. There's no need to manually copy files up to your web server.